NEWPORT BEACH — Recreational boaters; Balboa Marina’s owner, the Irvine Co.; and nearby Linda Isle residents might all get what they want out of a new proposed public dock and marina expansion project, presented to the Newport Beach Harbor Commission at its Nov. 9 meeting. “This project is exciting, and really is a win-win-win situation,” said Harbor Commission chairman Ralph Rodheim. Utilizing the water area where the Reuben E. Lee restaurant riverboat once sat near the Coast Highway Bridge in Newport Harbor, Irvine Co. representative Dan Miller introduced a plan to increase Balboa Marina by nine slips and create a separate public transient dock. 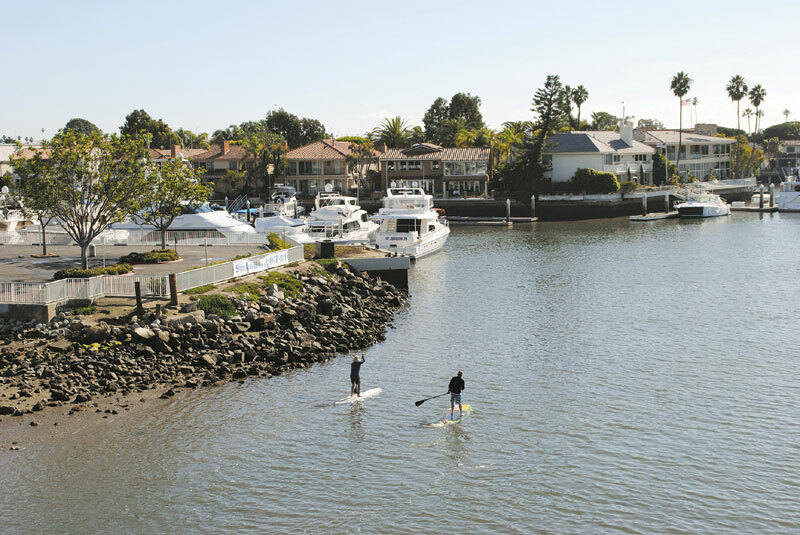 Currently, Balboa Marina has a four-slip public dock area contained within its private docks. California Recreation Co. — which operates the four Newport Harbor marinas owned by the Irvine Co. — was instructed by the California Coastal Commission to add the public docks when redeveloping the 105-slip marina in 2008. But while the public docks have added easier access to nearby restaurants and stores, private slip tenants have raised security concerns, Linda Isle residents living across the channel have complained of late-night disturbances at the public docks and boaters have complained of time-coded gate locks that often keep public dock users from getting back to their boats. Miller said the Irvine Co. has tried moving the docks to lessen the noise, and placed a gate guard at the docks to allow for public boater access. Now, with the west end open, Miller said the marina can expand around the corner and is planning to construct nine large boat slips and a separate public dock farther from the ears of nearby residents. URS Corp. representative Randy Mason, who specializes in waterfront-related projects, said the plan would involve constructing a public dock providing between 80 and 120 lineal feet of dock space, depending on whether the Irvine Co. would pursue a landside development project at the adjacent parking lot area that would require a seawall to be built. Currently, the parking lot is protected by riprap. If a seawall was constructed, the site has been marked to house up to 35,000 square feet of marine office space, and the additional water area would allow for inside tie ups along the public dock, increasing the useable space. Harbor Resources manager Chris Miller said the dock could operate like the Rhine Channel transient dock, available to boaters from 6 a.m. to midnight with a three-hour time limit. Along with the public dock, Balboa Marina would be constructing an additional four or five 57-foot slips and four slips in the 70- to 90-foot range. Currently, the marina’s largest slips are 57 feet. During the Harbor Commission meeting, Rodheim noted that he thought California Recreation Co. should push for even larger slips, stating that the marina would be getting back the four 20-foot slips that are currently being used as public dock space, mitigating any loss of smaller boat slips. The docks would be constructed to reach the out to the channel’s pierhead line, and Mason said that a stipulation would be added that did not allow for boats docked in the new slips to overhang past the fingers of the piers, keeping boats out of the federal channel. The topic was presented Nov. 14 to Newport’s Tidelands Management Committee, where California Recreation Co. general manager Greg Sinks discussed the project as a joint effort between the city and the Irvine Co. The city would take the lead on the California Environmental Quality Act (CEQA) process with the Coastal Commission, and the Irvine Co. would cover many of the construction costs. The marina expansion and public dock development would require about 10,000 cubic yards of sediment to be dredged from the area, and groyne construction to protect the docks from the increased tidal flows in the area, due to its close proximity to the Coast Highway Bridge, which funnels tidal flows from Newport Beach’s lower and upper bays. Miller said the city’s current budget allows for the conceptual design elements to move forward on the project, with CEQA permit work to be discussed in next year’s budget. “We wanted to put this out there — wanted to make sure it makes sense — and take it to Linda Isle community, and make sure they’re in agreement before moving forward,” Sinks said.